FULLY AUTOMATIC OPERATION :- Simply turning on the switch will put the burner in operation, Intelligent burner controller performs all the parameter checks i.e. flame detection, blower on, etc. In case of failure of any parameters puts the burner In lock out mode, switching off the gas supply and gives visual / audio alarm for operator attendance. 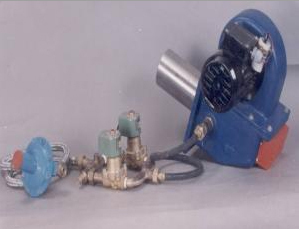 ON-OFF / HI-LO OPERATION :- Standard burner comes with on-off control which can be hooked up with automatic temperature controller / thermostat. 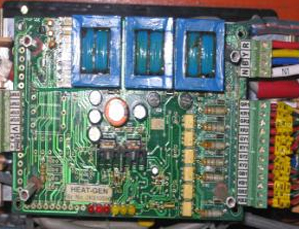 Specially developed Hi-Lo system for precise control over the set point (optionaf) which can be hooked up witfl Heat gen DTC 302 Temperature Controller (Optional) is supplied as per requirement of the customer. HG 2003/ 1 is a fully synchronised, true three phase angle thyristor power controller for 3 wire or 4 wire resistive, transformer coupled resistive & inductive loads. The output through 3 pairs of SCR''S in inverse parallel mode gives synchronised full wave control over all the three phases. The drive accommodates all feathers like soft start, current limit & over current limit as a standard features. It is built to work in harsh industrial environment. It gives very smooth control at the set value of a PID Controller with a 0 shoot up and shoot down which saves at least 5 to 10% of energy. This unit is well suited for Ovens, Kilns, Furnaces, Plastic Injection Moulding Machines & Many More where smooth control at set value is required. As this unit is vigorously tested in our own Furnaces, it can be used blindly on any equipment. Address : Corporate Office and Factory : W-369, MIDC, Rabale, Near Golden Garage, Navi Mumbai - 400701, Maharashtra, India.